Job vacancies at Portsmouth Historic Dockyard and its associated attractions are advertised within these pages and externally in the relevant press. Please only apply for vacancies that are available as we are unable to reply to speculative letters. What attractions are included as part of a Full Navy Group Ticket? The Mary Rose Museum is not part of a Full Navy Group Ticket and is a separate ticketed attraction. What if I'm a UK school? Experience the darker side to history this Halloween, where nothing is quite what you expected. After darkness falls, stories from the past are uncovered as Jack the Painter returns from beyond the grave. Museums After Dark introduce a brand new horror experience this Halloween as the cobbles come to life with your quaking steps and distant screams. We’ll be opening the gates on 30 and 31 October from 7pm until late – are you brave enough? Step inside Victory Gate as you learn the dangerous exploits of Jack the Painter and see where he came to his treacherous end. Jump onboard HMS Warrior and experience the legendary ship at night. Dimly lit rooms and suspicious sounds make way for more unsettling stories as you make your way around her decks. Delve into the mysteries of Rat Island and those who were buried there. Shocking truths are revealed in this horrifying conclusion. Dare to Discover his Story? Take a deceptively devious tour of the dockyard at night as you meet creepy characters who recount true horror stories from the past. Hear scandalous tales of tyranny, see unsettling encounters from villains and experience the wrath of Jack the Painter. Terms and conditions apply. This ticket must be brought with you and presented to staff on the night of the event. The experience will include some small spaces during the tour. No cameras or phones are permitted to be used during the tour. We ask that you do not touch the actors, and they will not touch you. Attendees must be 16 and over and if under 18 must be accompanied by an adult. Experience will operate in time slots and each time slot is approx. 90 minutes. A bar will be available at the end of the experience. Do you have what it takes to know Nelson? The Georgian navy ruled the waves for over a century becoming one of the most feared and respected in the world. Vice-Admiral Lord Nelson was part of that story, managing the fleet from his prized ship. Now it's time to put your skill and knowledge to the test in our 'Know your Nelson' quiz as we move through his life, from birth to death. Will you be scrubbing the decks or enjoying a rum tot with the Vice-Admiral himself. Get your official result at the end and share with your friends. Rediscover your love of Nelson as we bring together a host of must-see artefacts and exhibitions that are fit for a lord. From the battle-scarred Trafalgar Sail to the Georgian navy inside our galleries, there's never been a better time to discover Lord Nelson and his career as Vice-Admiral of the fleet. See amazing highlights including an original 42lb gun from HMS Victory (1620), a collection of astounding art pieces and a life mask taken from the man himself. At just 5 ft 4 in, Vice-Admiral Lord Nelson ruled the waves for close to 25 years, making him an adversary worth taking seriously. His stature and prominence as one of England's greatest naval heroes still resonates with visitors today as his story is retold through our museums and ships. From the legendary HMS Victory to the battle-worn Trafalgar Sail, his mark on history can still be felt. Follow in the footsteps of Nelson himself as you travel across the Historic Dockyard this autumn. William Wyllie is one of the most celebrated panorama artists of all time, most notably for his work on The Panorama of The Battle of Trafalgar. After taking nine months to complete and working non-stop, his masterpiece was formally opened by King George V on 29 July 1930. Discover his story and what techniques he used to bring the legendary battle to life. Do you know your Nelson from your Hardy? Let's get quizzical in our fun Nelson quiz as we test your know-how as we uncover his early years at sea until his untimely death. See if you can get top marks and rule the waves just like he did. Afterwards, share your score with friends as you try to climb the ranks of the Georgian navy. Dominic Tweddle, Director General of The National Museum of the Royal Navy reveals three of his favourite objects which show facets of Nelson's life in stunning detail. A locket of Nelson's hair, a silverware trunk and a collection of Staffordshire Flatpack all highlight the man 260 years on today. See each object and hear expert commentary behind each one inside The Nelson Gallery. Stay for a while and relax onboard historic ships, inside museums or kick-back in cafés and restaurants at Portsmouth Historic Dockyard. Take in the historic surroundings of a working dockyard as you view spectacular ships and marvel at our collections. Discover Boathouse 4 Restaurant at Portsmouth Historic Dockyard on your day out. Not only does it provide the perfect place for lunch or dinner but is also packed full of historic charm. If you're looking for a lighter bite, then visit the café on HMS Warrior, the Copper Kettle for a velvety hot drink and sumptious slice of cake. Grab a memento of your visit by following our handy guide that includes the top 10 photo opportunities at Portsmouth Historic Dockyard. Stand on the poop deck of HMS Victory and view HMS Queen Elizabeth or take to the water and get up close with HMS Alliance. Looking for an unusual dining experience? Treat yourself to an unforgettable dinner on board HMS Warrior. From a rum-themed dinner, to an evening of sea shanties, we know you'll find something that you'll love! As the UK’s premier destination for naval heritage, Portsmouth Historic Dockyard welcomes over 925,000 visitors a year, inspiring them with the stories of the men and women of the Royal Navy over the centuries. Find out about our annual pass and how you can access the Mary Rose. The Mary Rose Trust has decided to move away from the combined ticket offer. As of 1 April, the Mary Rose has not been part of the All Attraction Ticket and requires an additional ticket which can be purchased from the Mary Rose website or bought on the day. To help visitors understand this change we have stopped selling All Attraction Tickets and replaced them with a new Full Navy Ticket. The Full Navy Ticket is by far the best value option, giving you unrivalled access to top attractions including HMS Victory and HMS Warrior, as well as Action Stations, the ‘Lucky Ship’ M33, The National Museum of the Royal Navy, BoatHouse 4, The Jutland Exhibition, Dockyard Apprentice and a 45 minute boat ride viewing the harbour from the sea. It also gives you access to special events, activities and exhibitions - so you'll have plenty to see and do throughout the year. Visitors can also enjoy the Royal Navy Submarine Museum and Explosion Museum of Naval Firepower in Gosport which are accessed by a complimentary waterbus. If you have limited time, we now offer any 1, any 2 or any 3 attraction tickets which are valid for a day only. In April, the Mary Rose Trust left the combined ticketing agreement with Portsmouth Historic Dockyard. This means the attraction is no longer part of the Full Navy Ticket and requires a separate ticket. The Mary Rose museum no longer offers a combined ticket with Portsmouth Historic Dockyard. Visitors wanting to purchase a Mary Rose ticket will need to visit their website or buy one on the day at their visitor centre. We still offer our best value Full Navy Ticket which includes entry to: HMS Warrior 1860, HMS Victory, 36 Hours: Jutland 1916, National Museum of the Royal Navy Portsmouth, Action Stations, HMS M.33, Harbour Tours, Boathouse 4, Dockyard Apprentice, Royal Navy Submarine Museum and Explosion Museum of Naval Firepower. What if I bought my All Attraction Ticket before 1 April 2018? If you purchased an All Attraction Ticket before 1 April 2018, your ticket is valid up until the expiration date. The Mary Rose Trust will continue to accept your ticket until the expiration date if you purchased an All Attraction Ticket. If you purchased a Full Navy Ticket after the deadline, your ticket will not include the Mary Rose. Watch this space for 9 days of fit-tastic fun! From stepping onboard great historic ships to taking part in our fun naval fitness challenges – there will be plenty to see and do! Experience a working dockyard as you take in historic surroundings and marvel at magnificent ships from the Royal Navy's past and present. As you view HMS Queen Elizabeth from a Harbour Tour, you'll feel inspired to learn more about the workings of iconic ships in our collection. The contrast between old and new has never been so distinct. See HMS Warrior up close as you learn about the Victorian ingenuity behind its construction or visit HMS M.33, one of only three British warships from the First World War still in existence. Get up close to Royal Navy giants by water on a Harbour Tour. Feel the sea spray in your hair and see a working dockyard as you learn about the ships and surrounding area. There's plenty of opportunities to take photos of HMS Queen Elizabeth*, the UK's largest aircraft carrier alongside in Portsmouth Naval Base. “Whether you’re nuts about all things nautical or not, the Historic Dockyard is a fun day out." Buy an Full Navy Ticket today! See everything* for less than £4 per attraction. *HMS Queen Elizabeth is an active Royal Navy ship and from time to time will be at sea. Please check the website and social media for updates on its availability. The Mary Rose is not included in the Full Navy Ticket. Take in the historic sights and sounds of Portmsouth Historic Dockyard when you look for things to do in Hampshire. Rediscover your curiousity as you enjoy breath-taking views of historic ships, immerse yourself in special exhibitions and unique, rare collections or chat with knowledgable staff and volunteers who are always keen to share a quirky fact. Meet colourful characters from the past and learn about what life was like onboard our ships. Knowledgable staff and volunteers are on hand to offer an insight into our collections. Immerse yourself in stories from another time through specially curated exhibitions. For the perfect thing to do in Portsmouth, look no further than a visit to the Nelson Gallery to learn about one of history's most well-known figures, Vice-Admiral Lord Nelson, as you find out about his life onboard HMS Victory. Afterwards, visit the Hear My Story exhibition and be moved with accounts of those who served onboard Royal Navy ships. “When the Chelengk was unveiled in the Great Cabin of Victory… it caused the same gasps of astonishment as the original had more than two centuries ago." Take in the historic surroundings of Portsmouth Historic Dockyard and choose an exciting experience that suits you. Get up close and personal with the UK's largest aircraft carrier* on a Harbour Tour or brave our climbing wall inside Action Stations as you attempt to reach the top. 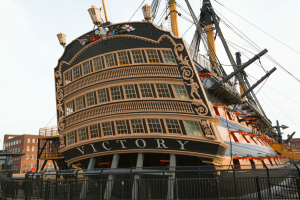 Experience HMS Victory, Nelson's famous flagship as you learn about history’s most famous battle. The stories of Vice-Admiral Lord Nelson and the crew are retold through first-hand accounts of those who served onboard. From Portsmouth Historic Dockyard, take to the water and discover HMS Queen Elizabeth*, the UK's largest aircraft carrier. Feel the sea spray in your hair and the fresh harbour breeze as you get the perfect photo for your collection. 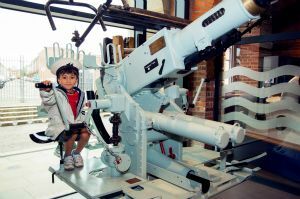 “I was really thrilled to find that the Portsmouth Historic Dockyard is as much fun (if not more) with a group of adults as it is with your kids”. Buy a Full Navy Ticket today! See 11 attractions* for less than £4 each. For something egg-strodinary this Easter, visit Portsmouth Historic Dockyard for fun activities for all the family. Complete our Easter trail and win a chocolate treat. Meet heroic animals from history and learn about their astounding efforts during the First World War. Explore 11 amazing attractions with our best value ticket and save when you book online. Wilf the Royal Navy Rabbit has been busy exploring our galleries, and he's been having so much fun he's left his eggs behind! Can you help Wilf find the eggs hidden in the ships and galleries at Portsmouth Historic Dockyard? 'Crack' the code and take your completed form to the Jutland Exhibition to collect your mini choccy treat. Plus be in with a chance of winning a chocolate hamper and a family Festival of Christmas pass. With our best value ticket in hand; plan your Easter break with a return visit in mind. Explore 3 ships, 3 submarines, 3 museums and more for one low price. Buy an annual ticket online and save on the walk up price - it's valid for a whole year. Take part in egg-citing activities over Easter inspired by heroic animals from the Royal Navy’s past. Learn about brave animal heroes whilst decorating your own edible medal with glitter, piped icing and hundreds and thousands. Or take part in object handling and come face-to-face with a stuffed ocelot. Looking for things to do in Portsmouth? Look no further than our historic ships, memorable museums and experiences you’ll never forget. From the climbing wall inside Action Stations or hearing captivating tales onboard HMS Victory. Get ready for an amazing day out fit for Vice-Admiral Lord Nelson himself. For unmissable activities for the kids, head on over to Action Stations for unforgettable experiences including simulators, the Ninja Force assault course, climbing wall and so much more. If you want unbridled fun and extreme pursuits, visit Action Stations for an all-out adventure. As a top family attraction, HMS Victory brings the stories of those who served onboard to life through an immersive story telling experience. Afterwards, visit HMS M33 and hunt for Miss Muggins in our activity trail as you explore the hidden depths of the ship. “HMS Victory is a stunner. It looks as if it’s been designed by Disney. You could be forgiven for temporarily thinking you’d stepped into a theme park or the set of Pirates of the Caribbean”. Nelson’s affair with Emma Hamilton was the biggest scandal of the age. Their actual liaison lasted only six years, but it transformed their lives, their respective positions in society, and the public's perception of them both. Horatio Nelson first met Lady Hamilton on 12 September 1793. He was a 35-year-old post captain and she was the 28-year-old wife of Sir William Hamilton, the British Envoy to Naples. Emma was a great beauty and a celebrated artists’ model, and she was also famous across Europe for performing ‘attitudes’, which were performances in which she moved quickly from one dramatic pose to another. Mired in retirement in Norfolk for the previous five years, Nelson had hardly seen a woman since he had returned to sea six months before their meeting, and he was impressed by Lady Hamilton. He wrote to his wife Fanny that Emma was a ‘young woman of amiable manners who does honour to the station to which she is raised’. A once-in-a-lifetime opportunity to see a piece of jewelled history arrives at Portsmouth Historic Dockyard for a limited time only. Vice Admiral Lord Nelson's famous jewel, the chelengk, has been carefully reconstructed and is now on display for all to enjoy. The diamond was presented to Vice Admiral Lord Nelson by Sultan Selim III of Turkey after the Battle of the Nile in 1798. For the last seven years Lachlan Goudie, judge on BBC’s Big Painting Challenge, has been sketching and painting in the BAE shipyards on the Clyde and Forth, chronicling the construction of the new generation of Royal Naval ships (specifically the world leading Type 45 destroyers and the monolithic Queen Elizabeth class aircraft carriers), as well as capturing the people who work to create these giants. This exhibition is the first opportunity to see Lachlan’s drawings and paintings on display in Portsmouth, HMS Queen Elizabeth’s home port. Enjoy a year full of new adventures at Portsmouth Historic Dockyard as we bring you exciting exhibitions and must-see conferences for every adventurer. For the last seven years renowned artist Lachlan Goudie, who was a judge on BBC’s Big Painting Challenge, has been sketching and painting in the BAE shipyards on the Clyde and Forth, chronicling the construction of a new generation of royal naval ships and the people who work to create these giants. With the much-heralded arrival of HMS Queen Elizabeth, a new exhibition of contemporary artwork will capture Lachlan’s personal view of these engineering titans. British Tattoo Art has seen a renaissance in recent years and that trend continues with Tattoo: British Tattoo Art Revealed. This ground-breaking exhibition sheds lights on the long tradition of Royal Navy tattoos as well as cutting edge designers and their designs. See 400 original artworks, photographs and historic artefacts from across the world. Developed by the National Maritime Museum, Falmouth, this in an opportunity to see these one-of-a-kind exhibitions as it tours the UK. The centenary of the daring Zeebrugge Raid which attempted to blockade the German forces at the Belgian port will be commemorated with a weekend-long conference. It will explore a variety of events surrounding the raid and on the morning of 23 April 1918 itself with a particular focus on its planning, its consequences and the challenges of the unforeseen situations that arise in covert raids. (Conference not included as part of your annual ticket). 15 June 2018 marks the 50th Anniversary of HMS Resolution, the Royal Navy’s first Polaris SSBN (Submersible Ship Ballistic Nuclear), commencing her first patrol. Our response is an exhibition (free with your annual ticket) focussing on personal accounts and key objects and a conference which will explore the history of the British nuclear deterrent. (Conference not included as part of your annual ticket). The National Museum of the Royal Navy presents a fascinating look at the personal accounts of those serving onboard at the heart of the Royal Navy Submarine Service. Hear stories from those who were submerged at sea for a three month patrol; the inevitable isolation from everyday life and the power of teamwork when in a state of constant readiness. Their stories will be told through personal accounts and key objects at this brand new exhibition at the Royal Navy Submarine Museum. Life under the sea poses challenges that go unseen and unheard. The exhibition will present an insight into life on board the "Silent & Secret" Polaris submarines, using personal accounts and key displays drawn from a number of National Museum of the Royal Navy sites, private lenders and other museums. Dining on fillet steak and drinking fine wines is captured in The Guardian's article on Silent and Secret. The life of those who served onboard Polaris submarines are revealed as journalist Steven Morris documents his findings from both sides of the argument for Britain's at-sea nuclear deterrent. Curator, Alexandra Geary gives us a tour of the brand new exhibition, Silent and Secret located at the Royal Navy Submarine Museum in Gosport. Alex shows two artefacts in the video as she talks about a nose cone of a missile and a firing panel used in training scenarios. She also discusses the cultural importance of highlighting Britain's at-sea nuclear deterrent. Get a glimpse of what to expect when you visit Silent and Secret: The Exhibition with your Full Navy Ticket. Are you looking for the perfect present for a loved one this Christmas? Our events offer fun-filled and unique experiences. From our Rum and Gin Festival to The Subaquatic Steampunk Weekend – we’ve got something for every adventurer. Calling all rum lovers! Come onboard HMS Warrior 1860 for an exclusive rum experience. Dine on one of the world’s most famous warships with a three course meal, half a bottle of wine and welcome drinks. Guests will be introduced to hand-selected rums from all over the world as well as talks on each blend. A three course meal will be served with live music and entertainment provided throughout the night. A rum and gin taste adventure waits for one and all. Explore two decks full of rum and gin onboard HMS Warrior for an unforgettable experience. Listen to our experts as they talk about how to drink your tipple. Exotic cocktails will be available to purchase from our dedicated rum and gin bar as you kick-back and listen to live music from local artists. Last year’s event sold out – so don’t forget to buy your tickets quickly! Get your aviator googles at the ready and join the steampunk revolution. Our annual splendiferous weekend returns, packed full of steampunk-inspired Victoriana. Enjoy live music and entertainment, relax and sample alcoholic delights in the gin and beer tent or watch our boutique steampunk fashion show. Step on to HMS Alliance, the incredible Cold War submarine at the Royal Navy Submarine Museum in Gosport on show with levers, lights and gadgetry. Find out what to expect when you buy a gift experience ticket for one of our events and how the process works. Read our list of frequently asked questions to learn more about unique experiences for friends and family in 2018 from Portsmouth Historic Dockyard. Do you provide a gift pack or box with every purchase? As a gift idea, each ticket gives you the flexibility to package it the way you want. Similar to other ticket websites, you’ll receive a confirmation email to say you have purchased the ticket. You could print the ticket to place in a card or alongside something else as a present. You control how you package it as part of a gift. Why is the ticket in my name? As the ticket purchaser, your details are used against the billing address as proof of purchase. Our system generates a unique ticket reference number which friends and family can use on the day. Are event tickets refundable or transferable? It’s really important you check the availability of the individual before purchasing – without making it to obvious. We appreciate the surprise element of event tickets however we are unable to provide refunds or transfer tickets for another event instead of the one purchased. Did you know that without National Lottery players, the £7.8billion of funding awarded to more than 42,000 heritage projects would not be possible? We wanted to return the favour by welcoming visitors, old and new to attractions run by The National Museum of the Royal Navy for free from 3 - 9 December. All you need to do is bring in a valid lottery ticket or scratchcard to show at our visitor centre and our team will give you a free adult or concession Full Navy Ticket ticket. (Not valid on children or family tickets). Terms and conditions apply. Here is a selection of some of the projects for which we would like to say "thank you"! The National Museum of the Royal Navy and Hampshire County Council have joined together to develop an exciting project to conserve, restore and interpret HMS M.33. As part of Heritage Lottery Fund week we are celebrating the support they have given us to make the ship accessible to everyone. The National Museum of the Royal Navy’s ‘Hear My Story’ at Portsmouth Historic Dockyard opened in 2014 and tells the untold stories from the ordinary men and women, who worked onboard our fleet of ships over 100 years of naval history. Although we were unsuccessful in securing the round 2 bid fpr SeaMore, a development grant of £433,500 million from the Heritage Lottery Fund was used for planning and design of the new Royal Marines Museum and national collection centre. This gives us a firm foundation for future plans. A £3.4 million grant from the Heritage Lottery Fund was given to the Alliance Conservation Project to save HMS Alliance, the last surviving British A-Class Second World War era submarine in Europe and a memorial to 5,300 submariners who have given their lives in service. In 2014, the Warrior Preservation Trust Limited received funds for the “HMS Warrior 1860 – Revealing the Secrets of Shipwrights and Sailors”. This project aims to digitise the archival collections and enhance the visitor experience with exciting new interpretation. In 2013 an endowment fund for HMS Victory was supported by a £5m award as part of the Catalyst Endowment Initiative - a joint programme between the Department for Culture, Media and Sport, Arts Council England and the Heritage Lottery Fund. One National Lottery ticket provides free entry for one adult or concession for one day only to any attraction owned by The National Museum of the Royal Navy. (Not valid on children or family tickets). The offer is valid from 3 to 9 December 2018 to any attraction owned by The National Museum of the Royal Navy. The National Museum of the Royal Navy has the right to refuse entry in the unlikely event of the venue reaching capacity, as well as other circumstances outside of its control. Tickets will be given at the point of entry at any National Museum site when visitors arrive with their National Lottery tickets. Let us lead you on a festive inspired trail across Portsmouth Historic Dockyard this Christmas. Come face to face with 12 magnificient nutcracker statues guarding 800-years of navy heritage as you discover the story behind each one. Painted by leading 3D artists, ‘Wild in Art’, our stunning nutcracker statues represent our very own 12-days of navy Christmas. Download our nutcracker pack and discover the inspiration behind each statue as well as our nutcracker trail map. Explore 11 amazing all-weather attractions this season, perfect for big and little kids for the ultimate day out in Portsmouth. Buy an Annual All Attraction Ticket online and save 20% today. Based on the 12 days of Christmas ditty, our naval-inspired nutcrackers have vividly been brought to life by leading 3D artists, Wild in Art. Our mischievous nutcrackers have been on parade to celebrate Christmas and all things festive. Watch our nutcrackers on parade video and choose your favourite statue. Can you find them all across the Historic Dockyard? When you visit Portsmouth Historic Dockyard next, you might hear a classic Christmas ditty playing across the Historic Dockyard, sung by Portsmouth Military Wives. Rewritten specially for us, the '12 Days of Navy Christmas' song is based on our 12 festively themed nutcracker statues. From gold braids to Henry's ship, the Portsmouth Military Wives delightful performance of a Christmas classic is wonderfully recreated in to a catchy naval number. Can you find the suspect in the quickest time? Included in your Victorian Festival of Christmas ticket, this interactive trail takes you on a journey across Portsmouth Historic Dockyard as you search for one of Lord Admiral Nelson's priceless chivalries. Get ready for a whodunnit mystery like no other, inspired by a Arthur Conan Doyle novel. Track down Holmes or Watson for the map to start this interactive adventure during the Victorian Festival of Christmas. For this game of mystery and wits, register online prior to arriving. A simple online registration from will need to be completed and an outline of how to play is provided. Pre-registration is required to record your details and time. Upon arrival, track down Holmes and Watson, outside Boathouse 4 and they will give you the map. The six suspects have tried to hide amongst the stalls and markets of the Victorian Festival of Christmas and it's down to you to find out who did it. Search for each suspect using the map. Once you find them, question their intentions and interrogate them. Take note of any hints they give you - they may even reveal the answer. Join us on 1 - 3 December 2017 for the Victorian Festival of Christmas at Portsmouth Historic Dockyard. Visit 150 stalls in our Christmas market, kick-back in Fagin's Tavern for festive entertainment and music or visit our historic ships and museums across the site. Advance tickets are available to buy online. The Wild in Art commissioned ‘Nutcrackers on Parade’ have grabbed headlines and captured the public’s imagination this December. Now is your chance to own a truly unique naval icon from history. Six of the giant nutcracker figures will go on public auction in January. The auction will finish on 1st February giving supporters, organisations and companies the chance to bid for their own giant naval legend. Help the National Museum of the Royal Navy raise the funds needed to continue to tell the epic story of the Royal Navy. The exclusive Nutcracker Farewell auction starts on Thursday 25th January and will run for 7 days. The six nutcrackers that are up for grabs in the auction will also be available to view at the Historic Dockyard whilst the auction is running. For details on the auction please register your interest here. HMS Queen Elizabeth is the most advanced warship in the Royal Navy fleet. The biggest, boldest, longest, heavyweight (65,000 tonne) champion of the military world, the carrier class can carry up to 40 aircraft. She will be deployed across the globe to serve the United Kingdom on operations for the next 50 years. This nutcracker was designed to represent the captain of the ship and the sea, featuring the aircrafts that this new carrier will be carrying. Colossol Carriers was designed by Deven Bhurke. Deven is an artist and graphic designer who has been involved in many Wild in Art events up and down the country. His work has appeared in the Big Hoot in Birmingham, Herd of Sheffield, Oor Wullie Bucket Trail in Dundee, and Pigs Gone Wild in Ipswich. Women have served in the Royal Navy for 250 years but 100 years ago, the Women’s Royal Naval Service (WRNS) motto was still ‘Never at Sea’. Having made their mark and proved their worth so powerfully they now receive the recognition and equal rights they deserve. This work is to be a celebration of determination, resilience, and success in the centenary year of the WRNS. This year saw the opening of the ‘Pioneers to Professionals: Women and the Royal Navy’ exhibition at Portsmouth Historic Dockyard. Jodie Silverman designed this memorial Wren as a celebration of the centenary of the WRNS. Jodie is a Manchester-based figurative artist and art therapist. She has been enthusiastically creating ever since she was old enough to hold a pencil. She gained a BA hons in Fine Art Painting and Printmaking from Leeds University in 2003 and went on to work for acclaimed animation company 'Cosgrove Hall Films' before undertaking an MA in Art Psychotherapy Practice, which she completed in 2009. She predominantly works figuratively in graphite and oil paints, She embraces the study of the human figure and enjoys learning classical drawing and painting techniques. Her influences are many and varied with the most prominent being Frida Khalo and Paula Rego. John ‘Jack’ Travers Cornwell, Boy Seaman First Class, was an incredible young man whose heroics helped the British win the 72-hour Battle of Jutland during the First World War. The Essex lad from a working-class background joined the Royal Navy at 15 and died less than a year later at 16 on his first and last fight against the Germans on board HMS Chester in May 1916. He was awarded the Victoria Cross, the highest military decoration for valour in the face of the enemy, having stood his post aiming the gun when the rest of the crew were killed, despite being mortally wounded himself. His ‘imperishable memory’ lives on in his name given to homes for disabled and invalid soldiers. The Scouts set up an award in his name, The Jack Cornwell Badge, which recognises devotion to duty, courage and endurance. Jack is represented in ‘Brave Jutland Jack’ rising from the sea with the poppies floating on the water and rising up to show he's no longer on solid ground and passed away after battle at sea. On the back is a version of a poster that was painted in 1917, with the details of his death and a portrait of Jack himself, with a poignant quote from the letter which was sent to his mum after his death, along with the bell from HMS Chester. He's also wearing the Victoria Cross, and the Jack Cornwell Scout award which was made up after his death in his honour for scouts who show courage and devotion to duty. Known as the lucky ship, HMS M33’s First World War livery is a black and white camouflage dazzle effect paint. Made in Belfast in 1915, this low freeboard monitor vessel was used mainly for bombardment and blockade. During the Battle of Gallipoli she was under the charge of Admiral ‘Jacky’ Fisher. Hailed as the greatest Royal Navy Admiral since Nelson, Fisher was famous for many things including introducing fresh baked daily bread on board, instead of hard biscuits, and for driving the development of the first all-big-gun battleships such as HMS Dreadnought. He had an unrelenting attitude. His legendary quotes include, “HIT FIRST. HIT HARD. KEEP ON HITTING” (letter to Lord Esher 25th April 1912) and ““Never contradict, never explain, never apologise” (letter to The Times September 5th 1919). The beloved ship’s cat, Mrs Muggins, enjoyed many saucers of milk at sea. The artist Jessica Perrin has taken this famous dazzle design to fashionable heights for our ‘First World War Dazzler’ nutcracker. Jessica Perrin is an animator and illustrator. Currently studying her Master’s degree at Birmingham City University, she loves to create both digital and traditional art which has strong narrative content. Her love for character design can be seen throughout her work, and her entry reflects her vibrant personality. Vice-Admiral Nelson was an inspirational leader and a national hero. He lost an eye capturing Calvi on Corsica in 1793 but did not wear an eye patch, contrary to popular belief. He died defeating the Franco-Spanish fleet at the Battle of Trafalgar in 1805. His love life and conquests were colourful too, his illegitimate child, Horatia, and six year affair until his death with Lady Emma Hamilton caused much public scandal. Roy Meats has taken the story of Vice-Admiral Lord Nelson and applied it to our ‘Legendary Leaders’ nutcracker, adorned with map and compass ready for the next mission. Upon completing his apprenticeship, Roy set up his own signwriting company. He was working mainly for all the different breweries up and down the country and painted pictorial signs for pubs as there was a big demand for hand painted signs. In addition Roy started designing and producing painted fire screens, clocks and furniture. With the demise of the brewing industry, the demand for signs and signwriting declined and Roy took a new direction into painting murals in children’s bedrooms, hotel themed rooms and children’s play areas throughout England and Europe. 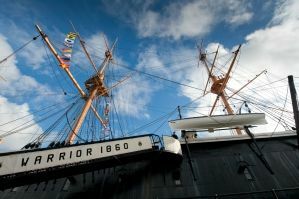 The mighty HMS Warrior 1860 was Queen Victoria’s figurehead of the iron-clad black battle fleet. Welcoming visitors at the entrance to Portsmouth Historic Dockyard for 30 years, Warrior strikes a powerful silhouette at sunrise and sunset and is a much-loved landmark in the city today. Figureheads are admired by all who visit Portsmouth Historic Dockyard and we have a fine collection available to view by our visitors. Artist Jessica Perrin, who has captured our Warrior figurehead in the ‘Fine Figureheads’ Nutcracker, has done an exceptional job and it would certainly be a fine addition to any collection. Jessica Perrin is an animator and illustrator working and studying in Birmingham. Currently studying her Master’s degree at Birmingham City University, she loves to create both digital and traditional art which has strong narrative content. Her love for character design can be seen throughout her work. If you are interested in knowing more about the auction, when it will take place, and how to bid etc. please fill in our form below and we will be in touch. Please enter your details below for information and updates about the Nutcracker Farewell Auction. Winter is the perfect time to discover new places together. Get 10% off The National Museum of the Royal Navy membership scheme, giving you unlimited access to 12 amazing attractions across the UK including HMS Victory, HMS Warrior 1860, Fleet Air Arm Museum, HMS Caroline and more. Experience freedom together with National Museum of the Royal Navy membership. Whether you’re exploring by yourself, together or as a family, the annual membership scheme gives you access to 4 incredible attractions including HMS Caroline in Belfast, The National Museum of the Royal Navy Hartlepool, HMS M.33* and others. With annual membership, you also get exclusive offers and discounts including 5% off Cunard cruises, 20% off Hovertravel, discounted cricket tickets at the Ageas Bowl in Southampton to name but a few. How do I get 10% off National Museum membership? The offer to buy National Museum membership will appear below 'what's the promotion?' from midnight on 27 November until 11.59pm the same day. Come back then to get 10% off National Museum membership. The National Museum of the Royal Navy membership gives you access to 12 amazing attractions across the UK. We're offering 10% off annual membership packages for one day only. Use code CYBER10 when you purchase your membership. Terms and conditions apply. Get 10% off annual membership from midnight on 28 November until 11.59pm. After this time, the offer will no longer be valid. The National Museum of the Royal Navy is a heritage organisation that manages 12 attractions across the UK. The membership scheme is valid for one year only. The membership scheme does not include access to the Mary Rose. With Christmas just around the corner, save up to 50% on the perfect gift for someone you care about. From cuff links to collectable globes, there’s something for all tastes. Treat yourself or others and support naval heritage at the same time in our online shop. What is Museum Shop Sunday? Museum Shop Sunday is a way for shops in cultural venues across the world to raise their profile during the busy Christmas shopping period. Help support naval heritage in Portsmouth and across the UK on #museumshopsunday, a national shopping event for the heritage sector. Our profits go towards supporting projects at The National Museum of the Royal Navy, an organisation which we’re part of. Grab some great gifts and curiosities in our online shop. Afterwards, share your purchases with us on Twitter and Facebook - use the hashtag #museumshopsunday. By sea, land and air, for hundreds of year, the Royal Navy has protected our interests at home and abroad. With a sense of duty and discovery, our collection of instruments, gizmos and trinkets reflect that spirit of adventure. Navigate our shopping page in search of the perfect stocking filler with cuff links, inspired by Cold War submarine HMS Alliance or a traditional naval keepsake. With globes and decorative pieces, our beautiful gift ideas will appeal to all. Choose from a fine collection of objet d’art, beautifully crafted and realised for those you love. Museum Shop Sunday is a national shopping day for museums and the heritage sector. Portsmouth Historic Dockyard and The National Museum of the Royal Navy is supporting this special day. We're offering up to 50% in the National Museum shop for one day only. Share your purchase by using the hashtag #museumshopsunday on Twitter, Facebook and Instagram. Terms and conditions apply. Museum Shop Sunday is a national shopping event. Discounts offered in the National Museum shop is for a limited time only on 26 November until 11.59pm. After this time, a new promotion will start. Items are discounted up to 50%. Get advanced tickets for our biggest events in 2018 for one day only. Whether you’re buying a ticket for your nearest and dearest or for yourself, there’s something for everyone in our early access event. From our rum and gin festival to our steampunk weekend, get ahead and buy your tickets before time runs out. Get your aviator goggles at the ready! The Subaquatic Steampunk Weekend returns in 2018. Fan favourite features return including steampunk performers, the gin and beer tent and our boutique fashion show. Enjoy exclusive access to HMS Alliance, the incredible Cold War submarine, on show with levers, lights and an original periscope in your sights. Get in early with advance tickets for next year's headline events including Rum Festival 2018, The Subaquatic Steampunk Weekend and Festival of Christmas 2018. Be one of the very first people to buy tickets for our events at advanced ticket prices before tickets go on general sale. Terms and conditions apply. Our early access event runs from midnight on 25 November until 11.59pm the same day. After this time, a new offer will be advertised as part of our Black Friday event. Enter our festive colouring in competition for a chance to win your own special visit with Father Christmas! Anyone can enter, but children are strongly encouraged – winners will be picked at random once the competition closes. To enter, simply send us your masterpiece before midnight on Thursday 23rd November. You can do that be either tweeting a picture to us @PHDockyard or tagging us on Instagram @phdockyard – in either case, use the hashtag #NutcrackersInColour. Walk in a winter wonderland this Christmas as you take in 150 stalls at our Christmas market, kick-back in Fagin's Tavern and see Father Christmas and his reindeer. Find out what's in store for you with our Spooktacular Halloween Pack, full of free activites and fun ideas to make your half term the spookiest one ever! Solve a witches secret code, locate Miss Muggins in her maze adventure or make a Mary Rose pumpkin template. It's quick and easy to download. Simply enter your details and click download. Join us for a gruesome half term of fun at Portsmouth Spooktacular Dockyard. See our Halloween activities and events, free with an Annual All Attraction Ticket. Jump onboard our ships and use your wits to investigate a series of spooky happenings. With an Annual All Attraction Ticket in hand, come dressed up in Halloween costumes if you dare, as you take part in fun activities and events. There's plenty to see and do this half term. Make the most of our spooky events and activities with an Annual All Attraction Ticket as you follow a gruesome trail around the Historic Dockyard. If you solve the mystery, you can collect a trick or treat prize and be entered into a prize draw with the chance to win one of four Victorian Festival of Christmas family tickets. Start your half term adventure and download our free Halloween spooktacular pack. The pack includes a Mary Rose pumpkin template, Miss Muggins magical maze and a witches secret code for you to crack. Simply add your details and download your pack today! With your Full Navy Ticket in hand, get ready to view HMS Queen Elizabeth from three unique vantage points. For the perfect photo, start your adventure at HMS Victory and climb the stairs to the historic poop deck. Take in the scale of Britain's largest aircraft carrier alongside Portsmouth Naval Base as you set up your shot. Afterwards, visit the National Museum of the Royal Navy Portsmouth. As you see the stories of those who served onboard historic ships, take a moment and visit the viewing platform. Capture HMS Queen Elizabeth from a different angle and contrast HMS Victory against the scale of this modern marvel. For a refreshing change of pace, head out on the water on a Harbour Tour and get up close and personal. See the scale of this gigantic ship and marvel at the ingenuity behind her design. Book your Full Navy Ticket for a whole year of FUN! Visit 11 amazing attractions as well as view HMS Queen Elizabeth with a Full Navy Ticket. Save 20% on a year’s worth of fun as you explore our spectacular ships and marvellous museums. How long is HMS Queen Elizabeth in dock for? HMS Queen Elizabeth is currently alongside Portsmouth Naval Base. We don't get information on when she'll be leaving as we're often told the same day about her departure. We’d like to thank everyone who entered our competition to win the ultimate ticket bundle. The competition closed at midnight on 18 August with the winner announced after this time. Don't forget to stay posted on our Facebook and Twitter page for the latest news, promotions and competitions. Find out what's in store for you with our summer adventure pack which is full of activities to make your summer more enjoyable. See our epic events programme to help plan your next adventure with us. Learn morse code and create your own message, solve the ship maze, spot the difference in our mascot challenge or try our Second World War word search - it's quick and easy to download. Simply enter your details below. See the dockyard come alive this summer and meet Royal Navy characters from the past. Take part in fun activities and events as kids go free with every adult Full Navy Ticket. In the Summer of 2016 HMS Alliance was used as a location for filming the new Transformers film: Transformers 5: The Last Knight. Cold War submarine HMS Alliance got a dusting of Hollywood magic when it was used as a location for Paramount Picture's Transformers V: The Last Knight. The film is on general release from Friday 23rd June and eagle-eyed fans will see HMS Alliance making an appearance. The filming caused quite a stir in the town as fans gathered at the gate to catch glimpses of the stars Sir Anthony Hopkins and Mark Wahlberg and cars. As many as 300 fans were at the gate when news got out that filming was taking place. "Film tourism is a brilliant way to broaden our appeal to the family market. The film crew has been incredibly creative and respectful in their treatment of Alliance. Whilst we can't promise that our visitors will see any famous faces, we can promise they will have a great day out!" Transformers 5: The Last Knight. It was a brilliant experience being a location for the Transformers 5: The Last Knight filming last year. If you have any images that you would like to share with us please tweet at us @PHDockyard or post on our facebook wall. We really value what our volunteers do here at Portsmouth Historic Dockyard. They give their time, energy, knowledge and passion everyday and really make a difference! You could learn exciting new skills, meet new people and stay active in historic surroundings. There are plenty of reasons to become a volunteer for one of the UK's leading maritime attractions. Whether you're looking to help in the day-to-day running of Portsmouth Historic Dockyard, connect with the public or get up close and personal with our ships and their incredible artefacts, we have something for everyone. If you’d like to become one, you can take part in our taster days – so register your interest and become part of something amazing! Derek, Pauline and Bill can be found on HMS Warrior most weeks! Don't miss out on meeting the team and asking plenty of questions. Roger and Barbara welcome guests with a warm smile on-board HMS Victory. Often in costume, our volunteers offer their knowledge to visitors everyday - making a real difference. At Portsmouth Historic Dockyard, we’re always being asked questions about ‘what makes a volunteer’– so we thought we’d answer them for you. Almost anything you want to do or can think of! If you have a specific interest we will try and place you where you want to be, whether that's collections, conservation or working with the general public. That's up to you. You can volunteer on any day of the week and at any time. Whilst some volunteering takes place during office hours, you can also volunteer at the weekends too, depending on what you want to do. You can be any age to volunteer at Portsmouth Historic Dockyard. We have students from local colleges, right up to our oldest volunteers who are in their 80s and 90s. Can I volunteer with my family and friends? Absolutely! We have many different groups of people including married couples and friends. Some volunteering is usually done in groups, so two or more people could easily join together. Do I get choose where I work? Yes, we like to find out which attraction/s you would like to work on and what you would like to do. Volunteering with us is a two-way relationship, we love working with you and hope you get something back in return. Yes, you can. The benefits regulations are clear that you can volunteer. We don't usually hold formal interviews but we do like to have an informal chat with you. This gives you and us the chance to assess each other and an opportunity to ask questions. Yes, of course. You are under no obligation to keep volunteering. However, it is always worth talking to somebody about this first. Thank you for visiting The Victorian Festival of Christmas and completing our survey. You have now been entered into the prize draw and we will notify you by email after 10:00 hrs on the 8 December 2016. Good luck. Discover the magic of Christmas! Travel back in time to a bygone era, where snowy Dickensian streets welcome you to a world of festive cheer, as you enjoy one of the south’s finest Christmas festivals from the 30 November to the 2 December 2018, 10am-6pm each day. Plus enjoy the parade of characters at the end of each day - back by popular demand! Get your tickets before 31 October at early-bird prices! This year we're celebrating Portsmouth-born Charles Dickens, seen by some as the father of the modern Christmas! Meet characters from Mr. Dickens' most famous novels including Oliver Twist, The Old Curiosity Shop, Great Expectations, David Copperfield, and A Christmas Carol. Meet the fearsome Miss Havisham or the grump Mr Scrooge - you might even spot the legendary author himself. Test your knowledge of Charles Dickens and his literary works in our special quiz. Alongside our traditional festive entertainment, why not visit our brand new gin and prosecco parlour for an added bit of indulgence. Dickens himself was said to have been a fan of gin and was impressed with the new fangled "cocktail" on a trip to America in the 1840s - the Gin Sling became a firm favourite of his for the rest of this life. Warm your spirits and raise a glass of gin in toast to Mr Dickens in the brand new Gin & Prosecco parlour. We’re bringing our very own Curiosity Shop to the Dickens Christmas Festival but some have gotten loose! Can you find all the festive characters in time before Christmas ends? See if you can spot The Living Snow Globe – the most curious object of them all, as she wanders around the Historic Dockyard. She'll often be seen near snowy areas and loves being the centre of attention. Can you try and get a picture with her? Try and make her smile - it won't be easy! An exciting opportunity has risen to work in a brand new cookhouse in the heart of the historic dockyard, the position is on a variable contract, working Monday-Sunday with occasional evening work- If you think you’re the right person for the job, We look forward to hearing from you. • To protect all company property in the unit and maintain all such property in a manner of good and safe repair. • The conservation and restoration of small boats from the Portsmouth Naval Base’s collection that come to us for repair or restoration. • Leading a daily tour of our workshop floor telling visitors about the work underway. • Telling our visitors about the significance and history of small boats in the Royal Navy and building boats in Boathouses 4,5,6,7. • Demonstrate aspects of woodworking/boatbuilding or rope making to visitors – Training can be provided. • Welcoming and interacting with our visitors. • Help with our ‘hands-on’ activities and workshops for all ages. • Crew our fleet of WWII boats. Want to buy a truly unique gift for someone this Christmas? Our popular Christmas Market is the perfect place, with a variety of original items, not to be found on the high street. The market areas will feature many new stalls to browse and choose from. Refreshments will also be available, as well as clothing, jewellery, arts and crafts and homeware. There really is something for everybody. Whether you're looking for a one of a kind special item or something to keep you warm in the long winter months ahead, you will find them at The Victorian Festival of Christmas. At the Victorian Festival of Christmas we have atmospheric works of art available for you to buy. Sculpture, abstracts, ships and landscapes often sold by the artist themselves. Some loved ones present a challenge when it comes to Christmas gift shopping. At The Victorian Festival of Christmas, we hand pick our traders to help make the task a whole lot easier for you. Need some inspiration to update your interiors this festive season? Our traders have plenty of unusual and unique items to adorn and enhance your home. Compliment your seasonal outfits with one of the many glamourous, dainty, delightful jewellery on offer at our festive event. Peruse a fantastic selection of handmade wooden toys and gifts, handcrafted jewellery and ceramics, traditional Christmas decorations, stunning household items and much more! Christmas is a time to put aside the diet and indulge for just a few days over the festive period. Why not treat yourself, friends and family to some real treats this season? Boathouse 7 requires waiting staff to work in our busy cafeteria in the heart of Portsmouth Historic Dockyard. Hours of work are predominately 9-5 including weekends, with some evening shifts. Performing a variety of tasks associated with food service in a high volume cafe and delivering excellent customer service in the catering unit. If you think you are the person for the role in this busy, vibrant and friendly unit, we would like to hear from you. We are extremely sorry but our ticketing system is undergoing urgent update work and will be unavailable for a few hours. We thank your for patience please return soon and purchase your tickets. Many of our attractions rely on fundraised income to enable them to be preserved and kept open to the public. Please select the project you wish to support below. HMS Warrior is one of the world's most significant historic warships. The ship is the responsibility of the Warrior Preservation Trust, an independent charity established by Sir John Smith that is not supported by any Government Department. It depends entirely on income raised from visitors, corporate hospitality and weddings, filming, fundraising and the generosity of its supporters to preserve the ship to a high and safe standard for the benefit of this and future generations. Please donate to enable us to continue telling the stories of the men and women who bravely serve, and the veterans who served in the Royal Navy. Your donation will directly help us teach and inspire future generations. Your generous donation will enable us to continue preserving this remarkable piece of the British history and heritage; helping us keep the memory of the people who served on her alive and letting us provide generations with one of a kind historical experience. Portsmouth Naval Base Property Trust is responsible for the conservation, maintenance and sustainability of the land and buildings in Portsmouth Historic Dockyard. The Trust is also responsible for the ongoing conservation of the largest collection of small Naval craft in the world. If you are passionate about naval history and craft, architecture, landscape design and the built environment please support us. 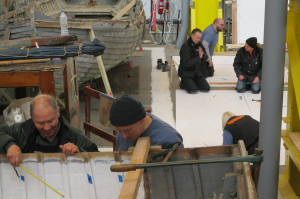 IBTC Portsmouth is a charity with a passion for traditional boatbuilding. If no one were to teach these skills then who would be qualified to look after the many Heritage craft of which we are all so proud? By supporting our students, donors will be part of this important work, maintaining, restoring, rebuilding and new building of traditional and modern wooden craft. Perpetuating these skills is vital if we are to hand these wonderful boats on to the next generation. Boathouse 4 is a great fun day out for kids this October half term. Keep the kids active and stop them getting bored with our brilliant new historic small boat attraction, which opens on Monday 26th October. With hands-on children’s activities and brand new indoor mast climbing experience, it’ll be a day to remember. The building was constructed in the rearmament period before the Second World War and has also been restored and converted into a Boatbuilding Skills Training Centre and is now home to the International Boatbuilding College Portsmouth and Highbury College. These two colleges are training a new generation of students in the techniques of traditional boatbuilding and other related skills that are still very much required today to build and conserve wooden boats. Boathouse 4 is currently being restored and will open in 2015 as a Boatbuilding and Heritage Skills Centre. The centre will offer practical, intensive courses in traditional boatbuilding and related skills, with stunning views across Portsmouth Harbour. Visitors will be able to watch traditional boatbuilding in action and enjoy the fascinating story of small boats in the British Navy. The prize is for one limited edition signed Morrisons Great South Run print by Jim Edwards. One additional special prize will be awarded of an All attraction Ticket (annual) to the Portsmouth Historic Dockyard for the most popular image uploaded to Instagram (as voted by Instagram users). By entering the contest, entrants consent to the use of their names, city of residence, photograph and/or image for publicity purposes in all media carried out by Portsmouth Historic Dockyard without payment or compensation. All entries shall become the property of Portsmouth Historic Dockyard, and their directors, officers, representatives, advertising and promotional agencies are not responsible for contacting or forwarding prizes to entrants who provide unclear or incomplete information or for entries lost or destroyed. This competition is not open to employees of Portsmouth Historic Dockyard/National Museum of the Royal Navy, their families, their agents or anyone professionally connected with the promotion. No cash alternative will be offered. The prize is non-transferable. The prize cannot be used in conjunction with any other discounts or special offers. 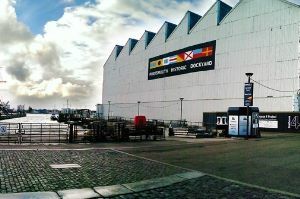 Portsmouth Historic Dockyard and its partners reserve the right to amend the specification of the prize or offer an alternative prize of equal or greater value. Entries must be submitted by the named entrant and will be invalid if found to come from a third party. Portsmouth Historic Dockyard have organised this contest in good faith and do not accept liability relating to the prize. Closing date is 27 October 2015 at 12:00hrs. The overall prize is for a bundle of prizes. Bundle includes: VIP Tour of the Mary Rose for 2 x Adults Plus Photo Opportunity on Bridge Balcony. 2 x VIP Victorious Festival Tickets For A Day Of Your Choice Worth (Nearly £200). These are Premium Victorious Tickets (includes standard entrance). 1x Family All Attraction Ticket (2 adults and up to 3 children worth £78). This ticket gets you and your family (2 adults and up to 3 children) a year’s access to all of our attractions. Family Ticket to Explosion Fireworks at Explosion Museum of Naval Firepower Gosport. The winner will be asked to launch the firework display and enjoy the evening of fireworks, on October 30th, on us. Family Ticket to Victorian Festival of Christmas (Worth £42). The lucky winner will get entrance for a family (2 adults and up to 3 children) to our Christmas Festival that runs from Friday 25th November - Sunday 27th November 2016. There will be a private photo opportunity for the whole family with Father Christmas. For the name of the prize winners, please check the http://www.historicdockyard.co.uk/index.php website after 23:59hrs on the 19th August 2016. Closing date is 19th August 2016at 23:59hrs. Grab yourself a truly fantastic prize for an unforgettable experience in Portsmouth. Portsmouth Historic Dockyard is working with Victorious Festival to offer a mega bundle of prizes - and we know this is going to be a popular competition. Get more entries by visiting our Portsmouth Historic Facebook page, tweeting about our offer and subscribing to our newsletter. The stunning Victorious Festival site surrounds the iconic Southsea Castle - which historical figure had this Castle built? The competition closes at midnight on August 19th. One prize winner will be selected and notified by email. What is in the "Mega Bundle" of Prizes? You will be whisked off to Victorious Festival at Southsea Common, which is headlined by Manic Street Preachers on the Saturday and Noel Gallagher’s High Flying Birds on the Sunday, plus many, many more exciting acts to see. One lucky winner will be asked to launch the firework display and enjoy the evening of fireworks, on October 30th, on us. The lucky winner will get entrance for a family (2 adults and up to 3 children) to our Christmas Festival that runs from Friday 25th November - Sunday 27th November 2016. There will be a private photo opportunity for the whole family with Father Christmas. You MUST print your ticket and bring it with you. We expect routes into Portsmouth to be very busy during the Festival. Please note that the Waterbus service will NOT be running during the Festival, and your tickets are NOT valid to enter off-site attractions. It is very likely that you will need to queue, as the Festival is very popular. We will be operating 100% bag search at this event. Please expect to have your bag searched. If possible, please avoid bringing bags into the event. There will be a short delay, but we will keep this to a minimum. The queuing system will be slightly different to previous years, but plenty of staff will be on hand to guide you into the correct queue. If you want to leave the Festival and return on the same day, for example if you want to go back to your car to collect something or drop off some shopping, your hand will be stamped on exit to allow you to return whenever you like on the same day. The prize is a £50 voucher for John Lews Partnership. This competition is not open to employees of Portsmouth Historic Dockyard, their families, their agents or anyone professionally connected with the promotion. historicdockyard.co.u and its partners reserve the right to amend the specification of the prize or offer an alternative prize of equal or greater value. For the name of the prize winner, please check the http://www.historicdockyard.co.uk/index.php website after Monday 25th December, 2015.
historicdockyard.co.uk have organised this contest in good faith and do not accept liability relating to the prize. Closing date is 25 December 2015 at 11am. The prize is a £50 voucher for John Lewis Partnership. By entering the competition, entrants consent to the use of their names, city of residence in all media carried out by National Museum of the Royal Navy without payment or compensation. All entries shall become the property of National Museum of the Royal Navy, and their directors, officers, representatives, advertising and promotional agencies are not responsible for contacting or forwarding prizes to entrants who provide unclear or incomplete information or for entries lost or destroyed. http://www.nmrn.org.uk/ and its partners reserve the right to amend the specification of the prize or offer an alternative prize of equal or greater value. The competition winner will be contacted by email 5 days after the competition end date of 29th February 2017. Winner details available by written request. http://www.nmrn.org.uk/ have organised this contest in good faith and do not accept liability relating to the prize. There are 295 car parking spaces at the Portsmouth Historic Dockyard Car Park, which is situated approximately 400 yards from the main entrance at Victory Gate. 17 of these are disabled parking spaces. This undercover car park has toilets and a baby care suite for visitors. This car park has a height restriction of 2.1 metres (6' 10"). Open 7 days a week 24 hours a day. Our car park accepts cash and card payment. Unfortunately, we do not accept AMEX, and the charge is a minimum of £2.60. The Park and Ride is conveniently located on the M275 offering a fast and reliable service into the city. At peak times, the service runs every 12 minutes. It is open seven days a week and stops at The Hard which is a 5 minute walk from the Historic Dockyard. For more information on Portsmouth Park and Ride, please visit the Park and Ride website. If on arrival you find that this car park is full, please follow the signs to the alternative car parks locally which are signposted from Queen's Street or at Gunwharf Quays, which is within five minutes walk of the Dockyard. There is a designated area within the car park for 20 motorcycles. If you park within these designated areas, you will be eligible for 1/2 price parking (if you park in a standard car parking space this offer does not apply) and this must be claimed from the car park office during normal opening times. There is a Pay & Display car park situated on Havant Street which is suitable for camper vans. This is around a 5-minute walk from our main entrance. For those using satellite navigation devices, the postcode of Portsmouth Historic Dockyard is PO1 3LJ, which will get you to the vicinity, then please follow brown tourism signs for the car park. The Portsmouth Historic Dockyard car park in Admiralty Road and that at Gunwharf Quays meet the most up to date standards and are manned and covered by extensive CCTV surveillance. However, as with all car parks, visitors are strongly advised not to leave any valuables in their vehicles during their visit to the Portsmouth Historic Dockyard. Portsmouth Historic Dockyard, with its collection of historic ships and building makes a great location for both film and TV. We welcome all sorts of filming on our site, from historical documentaries to film and photography shoots. All filming requests at Portsmouth Historic Dockyard are to be addressed through the Press Office. We also deal with contracts and location fees. Please contact us with your individual request and we’ll be happy to discuss your requirements. We request that the size of film crews is kept to a minimum, due to limited space on board our ships and inside museum galleries. Filming can be accommodated Monday to Friday. We request that film shoots that rely on a quiet location and minimum disruption to the crew, takes place outside visitor hours. The data controller is the National Museum of the Royal Navy - registration reference ZA068782. “Attractions” refers to all attractions located within the Portsmouth Historic Dockyard and those offsite, but which are included in the sale of the Full Navy Ticket or variable attraction tickets offered by PHD. Full Attraction Ticket purchased now include the use of a waterbus which operates between The Royal Navy Submarine Museum and Explosion Museum in Gosport, and Portsmouth Harbour. The waterbus has limited capacity and is operated on a first come first served basis and is therefore subject to availability. PHD reserves the right to cancel this service at any time. The Royal Navy Submarine Museum is included as part of a Full Navy Ticket and is open from 10am - 5pm every day during Summer and 10am - 4:30pm during Winter with the exception of Mondays and Tuesdays when it is closed (except for Hampshire school holidays and half terms). Explosion Museum is included in a Full Navy Ticket and is open daily from 10am - 5pm during Summer. It is open Saturday and Sunday only 11am - 3pm, during Winter (last admission to the galleries at 2pm). A Full Navy Ticket to Portsmouth Historic Dockyard gives 12 months unlimited entry from the visit date printed on the ticket to all attractions excluding special events. The variable Attraction Tickets are valid for one day only excluding special events. A Full Navy Ticket and variable attraction tickets are not valid for any special events taking place at the attractions or within Portsmouth Historic Dockyard. Please see our events page for upcoming events. Event tickets For certain events, concessionary rates are available (ID may be required). Check individual events for prices. Full Navy Ticket cannot be used on educational visits. If in the event of any complaints, please direct enquiries to Customer Complaints, Portsmouth Historic Dockyard, Visitor Centre, Victory Gate, HM Naval Base, Portsmouth, PO1 3LJ or call 023 9283 9766. For more information on our complaints procedure, please download complaints procedure PDF. For more detailed information on planning an education visit to Portsmouth Historic Dockyard, please see our learning section. To qualify for discounted rates, a group must comprise of at least 15 people.